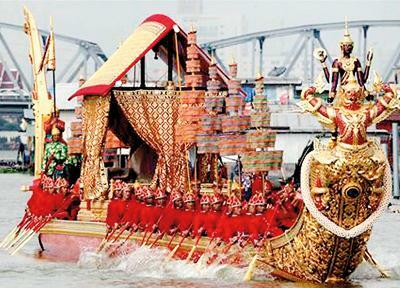 The Royal Thai Navy is begining rehearsals for a royal barge procession, the royal kathin ceremony, on November 9. The procession will start from Rama VIII Bridge (Vasukri Pier) and go down the Chao Phraya River to Wat Arun Ratchawararam, or Temple of Dawn, in the ceremony marking the end of Buddhist Lent. The procession, which is also to celebrate the 84th birthday of His Majesty the King on Dec 5, will occur between 3pm amd 5pm on Nov 9. Navy chief Surasak Rounroengrom said a fleet of 52 traditional barges and 2,200 oarsmen will participate in the procession. Eight small rehearsals will be carried out from Sept 21 to Oct 29 and two grand rehearsals on Nov 2 and Nov 6. Adm Surasak said the navy is coordinating with the Royal Irrigation Department on water management as the river current will impact the procession. So far there was no suggestion of a problem. Will it go near Saphan Thaksin? No idea, map of Saphan Taksin if that helps. Mpa of local area and Thonburi. BANGKOK (Reuters) – Golden barges shaped like swans and mythical sea creatures glided down the Chao Phraya river that winds through the Thai capital of Bangkok on Friday in a 700-year-old ceremony, with more than 2,000 rowers taking part. The Royal Barge Procession, held for the first time in five years and presided over by Crown Prince Maha Vajiralongkorn, emphasizes the importance of water to the people of Thailand.�Water has historically been a lifeline for Thais and expressions such as “nam jai”, which translates as “water of the heart” or “kindness,” highlight this. “Tears roll down from my eyes when I watch the procession because it really is something extraordinary to behold,” said Kanjana Kamsongsee, 59, a hospital administrator who watched. The ancient procession, featuring 52 exquisitely crafted golden barges draped with strings of jasmine, was revived by Thailand’s King Bhumibol Adulyadej in 1960 after a lapse of several decades and takes place at the end of Buddhist Lent, with robes presented to Buddhist monks as part of the event. It was last held in 2007 to celebrate the king’s 80th birthday, with the crown prince presiding as he also did on Friday. King Bhumibol has been in hospital recovering from an illness since September 2009. Last year, Thailand was hit by its worst floods in half a century, with water submerging entire towns and villages, forcing the event’s cancellation. As the barges made their one hour journey down the river, 2,200 oarsmen dressed in ornate costumes – Thai navy sailors in reality – rowed in synchronized movements to the sound of chanting, passing iconic landmarks such as Wat Arun, the porcelain-encrusted Temple of Dawn.